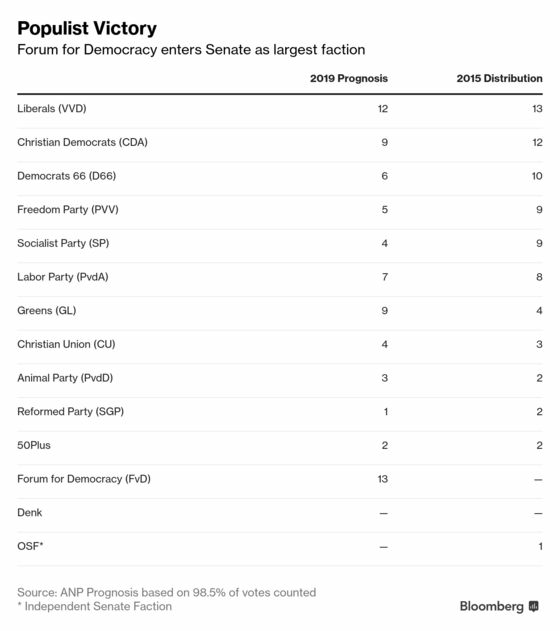 (Bloomberg) -- The anti-EU Forum for Democracy party is set to become the largest faction in the Dutch Senate, leaving Prime Minister Mark Rutte’s coalition government without a majority, and highlighting the challenge of tackling populism two months before key European Parliament elections. While Rutte’s own VVD party managed to limit losses, the overall outcome shows his cabinet will need to seek other alliances to push through his policy agenda in a fragmented political landscape that shows the rise of a new populist group. Forum for Democracy, which says it’s inspired by Italy’s anti-establishment Five Star Movement, claims to be the only one to advocate a drastic revision of the Dutch political system, aiming to break what it calls the “party cartel” of those in charge. It also shares some views with Geert Wilders, such as on the EU and calls for stricter migration rules. Forum, which only entered the lower house in 2017, is set to gain 13 seats in the 75-seat Senate, with Rutte’s VVD party winning 12, according to a prognosis published by news agency ANP on Thursday based on 98.5 percent of votes counted. Wilders’ anti-Islam Freedom Party is poised to pick up five seats, down from nine. The four-party cabinet is set to be left with just 31 seats, down from 38. 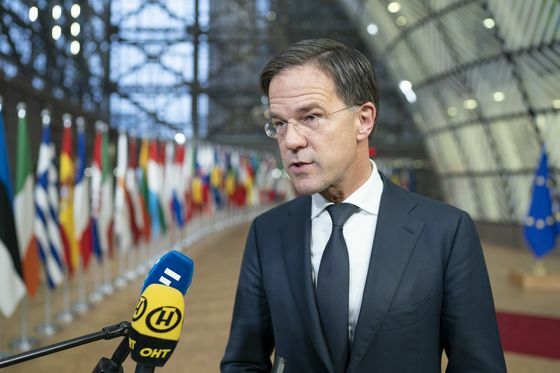 The Dutch coalition -- comprised of Rutte’s liberal VVD, the christian democratic CDA, the centrist D66 and the smaller Christian Union -- will need to find opposition support, such as from the Greens, in the Senate to pass key legislation including proposed climate measures. Based on the prognosis in Wednesday’s elections, the Greens are set to gain five seats in the Senate for a total of nine. The Netherlands seeks to cut emissions by 49 percent in 2030, making the question of the distribution of costs between corporations and citizens the dominating election campaign issue, until a gunman killed three people in a tram in Utrecht, just two days before the elections. Rutte’s cabinet will also see if Forum wants to collaborate with the coalition in the Senate, he told ANP, adding that he’ll look at possible majorities depending on the subject. “I would imagine that the party that came in first would be prepared to do so,” he added. Voters voted in the country’s 12 provinces, with members of the provincial councils formally picking senators in May. The seating in the upper house can be extrapolated from the provincial results.